In 1818, Mary Shelley wrote Frankenstein, creating the iconic concept, and incidentally creating modern science fiction. In 1935, Elsa Lanchester married the monster. 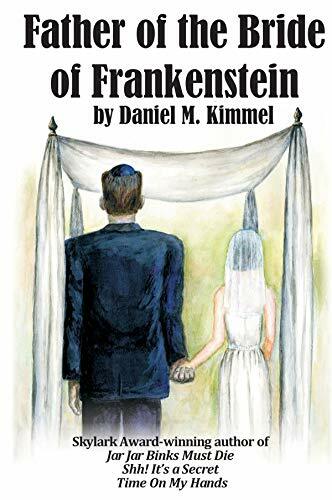 And now, Daniel M. Kimmel updates the myth, and tells us the tale from the point of view of the most important character: the Father of the Bride of Frankenstein. This is not Ms. Shelley’s monster, but (dare we say it?) a dazzling urbanite, literate and thoughtful… and Jewish? Science has always outrun the guidelines of ethics. It’s not unthinkable that interspecies relationships will be the next big question. And with those relationships will come a father’s love for his daughter, and that father’s fears for his bankbook when his doting daughter plans the most outrageous of weddings. Making your daughter happy can be a wild ride when her fiancé is being called subhuman, sued because of his very existence, and trying to keep a good Jewish home. Film critic and award-winning author Daniel M. Kimmel is the author of the Hugo-finalist non-fiction volume Jar Jar Binks Must Die… and Other Observations about Science Fiction Movies, and the novels Shh! It’s a Secret: a novel about Aliens, Hollywood, and the Bartender’s Guide, and Time On My Hands: My Misadventures In Time Travel. He is the winner of the 2018 Skylark Award (formally known as the Edward E. Smith Memorial Award for Imaginative Fiction), which is given by the New England Science Fiction Association for lifetime contributions to science fiction.